Actual Southern California locations where 1994's "Speed" was filmed. cars as the bus barrels down the shoulder of the offramp. building with the words "Molina Medical Center". Neither are to be found on Western Ave.
jumps 15 miles away to Long Beach. Yes, Long Beach! That's the Long Beach Hilton we see at the base of the "offramp". It's address is 701 W. Ocean Blvd. And the address of that Molina Medical Center is 1 Golden Shore St., in Long Beach. Worse, what we're really looking at isn't even really a freeway offramp! (Long Beach's main coastal route). That is the ramp that they used as the "Western Avenue"
freeway exit. What you are really looking at is this Shoreline Drive exit to Ocean Blvd. Ocean Blvd hits the Los Angeles River, near the south end of Long Beach (710) Freeway. into the path of the bus, forcing Sandra to swerve around it into the left, oncoming lanes. swerve appears to happen just west of the intersection of Ocean & Long Beach Blvd. located at the southeast corner of Ocean Blvd and Shoreline Drive, in Long Beach. Sandra successfully avoids hitting the bus, and continues driving - still on the wrong side of the street. the carriage, sending it flying - but it turns out that the carriage was just full of empty cans. once again suddenly leaps miles away (30 miles this time) for this next scene . In the photo above, the camera is looking west down Pico Blvd, just before West Blvd. the east of the first carriage shot, even though the bus is traveling west. * Locations marked by an asterisk (*) may be located in high-crime areas. 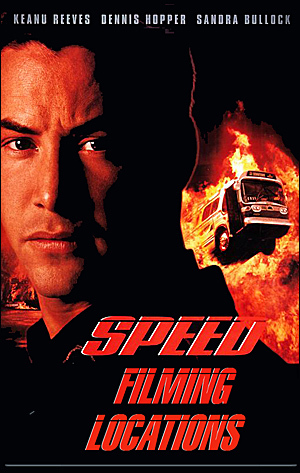 Most of photos on this page are stills from the DVD of "Speed"